Tigger dons his suit as the Masked Offender with his sidekick Piglet, and learns later on that he's doing more harm than good. Rabbit attempts to trick Tigger into using miracle shoes that can go very, very high. Pooh and Gopher try to fix the sky back. Someone is pulling pranks on the gang, but they don't know who. Rabbit tampers with Gopher's equation so the tunnel can't go through his house but his plans backfire. The New Adventures of Winnie the Pooh: S.3.E.17 Tigger Got Your Tongue? 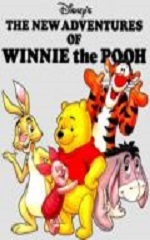 Tigger becomes mute, so Piglet and Pooh try to help him and save Rabbit's garden. Christopher Robin and his pals have a late night adventure. When Christopher Robin is invited to his first grown-up party, his friends begin to worry. Christopher Robin runs away from home after his statue is broken. Gopher buys a steam shovel and is wrecking the forest, so Piglet wants to convince Gopher to stop. It's Pooh's birthday and because the gang doesn't know how many candles to put on Pooh's cake, they come to believe that he is wise. Tigger has a problem when a cloud follows him around, constantly raining on him. Tigger doesn't like Piglet's too cute poems, so he adds some twists to excite himself.